Part one of our The Fosters 1×01 flashback recap concluded with a simultaneously awkward and touching moment: Callie declared Brandon to be “the real son” of the family and used the D-word to describe Stef and Lena, while Jesus laid the verbal smackdown by telling Callie, “They prefer the term ‘people,’ but, yeah, they’re gay.” It’s safe to say Callie did not make a great first impression, prompting Stef and Lena to address the fallout as The Fosters 1×01 continued. Here’s part two of our flashback recap. In the wake of the awkward exchange at dinner, Stef and Lena step outside to talk. 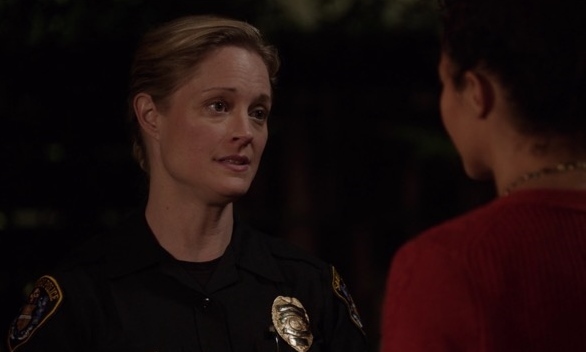 Stef’s understandably peeved that Lena brought Callie home without consulting her. “Honey, we can’t save them all,” she tells Lena – but is she saying that for her partner’s benefit or for her own? Especially now that we have three seasons of episodes to draw from, it’s abundantly clear that the faux-stern front Stef’s trying to maintain is hiding a heart of gold. After all, not only do Stef and Lena end up taking in Callie and Jude in season 1, but they also open their home to Kiara and Jack when the troubled foster kids need a temporary place to stay in later seasons. Anyway, back to The Fosters 1×01: While Stef’s not thrilled by the appearance of a bloodied Callie in their lives, she’s willing to listen to Lena’s reasoning and ultimately sees where her partner’s coming from. Well, lesbian and bisexual pop culture site AfterEllen begs to differ – it’s been using the #GaydyBunch tag since 2013. Back inside, Stef lays down the law to Callie: There’s a 7 p.m. curfew on weeknights; Callie needs to ask permission before leaving the house; and, while she’s staying with the Fosters, she’ll be attending the school at which Lena conveniently serves as vice principal. Callie’s more concerned with her immediate needs, like where she’s going to sleep, so Lena prepares the couch. Lena’s being so nice but Callie’s totally not in a place to accept or reciprocate that right now, so Lena alters her approach by asking Callie to “take it down a notch.” Callie acquiesces, and she’s juuust about to open up to Lena about Jude when Stef appears, inadvertently ruining the moment and causing Callie to clam up. Rather impressively, Callie managed to offend the entire family at dinner, so now Stef needs to do damage control. She finds the twins in Mariana’s room, and needless to say, they’re not happy. “You two are every bit as much our kids as Brandon is,” Stef assures them. Mariana seems particularly affected, and softening the hurt of Callie’s words will take more than Stef lovingly referring to Mariana as “Miss Thang” (her family nickname – which is something the character has in common with actress Cierra Ramirez). Brandon’s room is the next stop on Stef’s rounds, and tonight Stef asks her elder son to “step up while Callie is in this house.” Notice that she doesn’t ask him to “fall for Callie, kiss her at our wedding (thereby inadvertently causing her to run away), force us to take out a restraining order to make you stay away from her, then sleep with her and keep it a secret” – but I guess that’s what Brandon hears, because that’s exactly what happens over the next three seasons. Before any of that, though, Brandon needs to get over his judgy reaction to the news that Callie’s been in juvie, a fact that’s being shared with Brandon but kept from the twins. Arguably, the entire trajectory of Brandon’s character can be traced back to this one conversation. 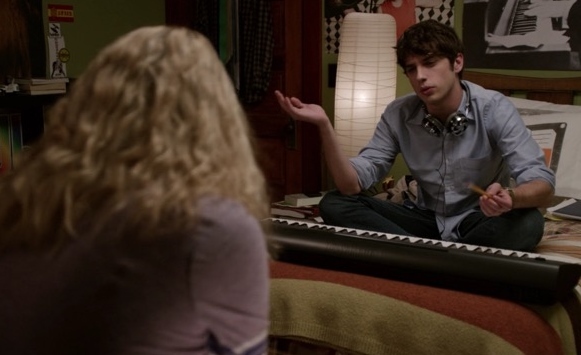 How would you explain the cavalcade of questionable decisions he makes throughout the first three seasons of The Fosters? “I don’t know”? Nailed it. While recapping season 3, I came up with the concept of Foster’s Law, which dictates that the absolute last person who should see, hear, or walk in on something in the Foster house will be the exact person who does so. (That’s what you get for going with an open-plan layout for your home, I’m just saying.) The first instance of this law coming into play occurs during The Fosters 1×01, when Callie walks in on Mariana surreptitiously siphoning some of Jesus’ ADHD medication from a bottle in the kitchen. Mariana claims she “needed some water,” but Callie knows what she saw – she just doesn’t have the full story.